I love pita chips. They’re crunchy, salty, relatively healthy (hey, at least they’re baked! ), and they go with just about any dip (I love them with homemade hummus). But I find that my favorite brands of pita chips are rarely on sale and often cost a pretty penny (plus the bag is half air anyways – what’s up with that?). 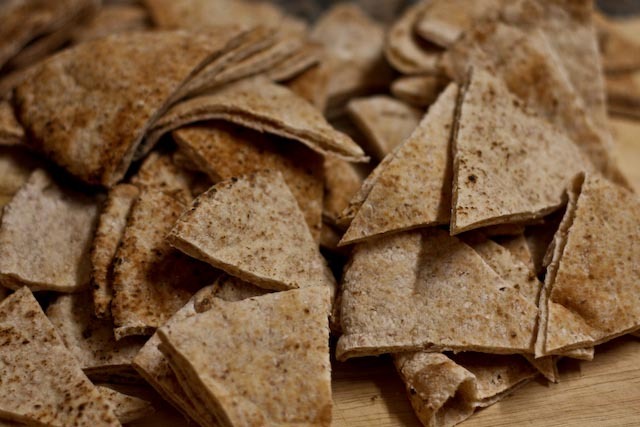 In case you also love pita chips and find the store-bought variety to be a bit pricey, I thought I’d share with you a super easy way to make pita chips at home. Start with good pita bread. Make sure it’s relatively fresh (no mold please!). 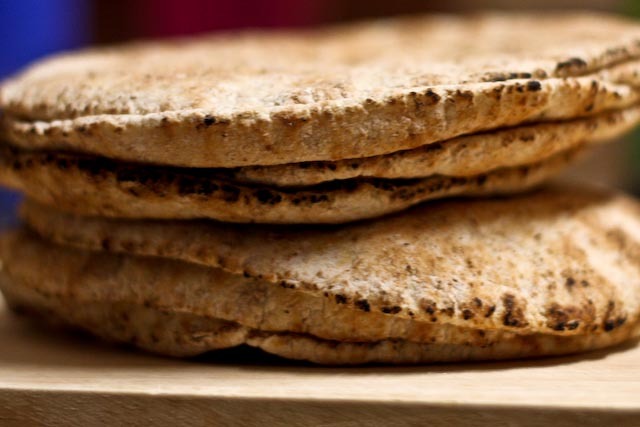 I like using whole wheat pita bread, but regular old white pita bread works just fine. I cut each pita bread into eight triangles. This is a good size for dipping. Arrange the slices in an even layer on cookie sheets. Drizzle with olive oil and salt and bake! It’s seriously that easy. 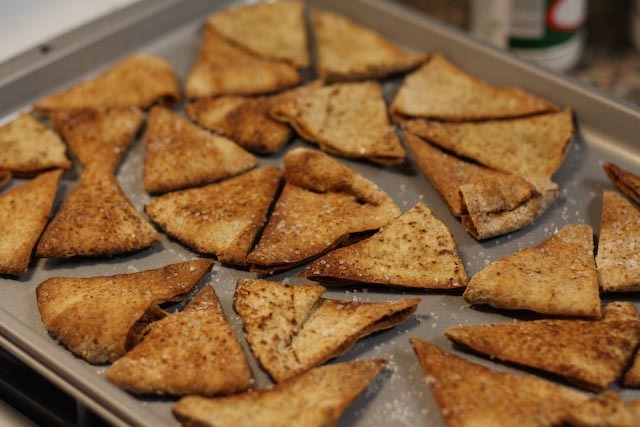 Homemade pita chips are at your fingertips! Baking them on a relatively low temperature allows the chips to brown without burning. Preheat oven to 350ºF. 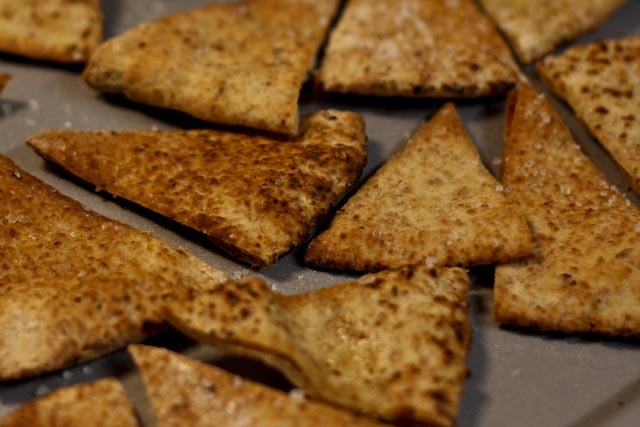 Cut each pita bread pocket into eight equal triangle pieces. Arrange the triangles in a single layer on two large baking sheets. 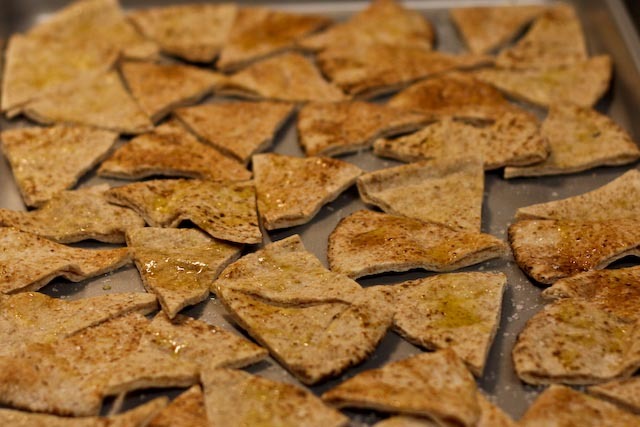 Pour olive oil into a small bowl, and using a basting brush, lightly brush the pita triangles with olive oil. Season with kosher salt. Bake for ten minutes, rotating baking sheets half way, or until the pita chips are golden brown. Remove from the oven and allow to cool. Serve with hummus or any other favorite dip. Ohh these look AMAZING!! YUM! I love homemade pita chips.